nein nein, ich bin seit oktober zurück und seit dezember am schneiden in berlin ;-) momentan bin ich gerade am skript schreiben. es nimmt langsam form an. This project ended successfully on 23/2/2013 12:00! You will get a sachet of classic Kyrgyz spices from the bazaar + an invitation to my premiere. You will receive a postcard from Kyrgyzstan with the signatures of real Kyrgyz nomads on it + an invitation to my premiere. You will receive 250g of the best dried Central Asian fruit you've ever tasted AND some Kurut balls (traditional dried yogurt balls sold at bazaars) + an invitation to my premiere. 1 square meter of apple paper (dried apple sauce in form of a razor-thin sheet) AND Chechl (smoked salty string-cheese) + an invitation to my premiere. I will bring a Kalpak (a traditional Kyrgyz felt hat only worn by the elders) home for you OR a handmade felt seat cushion with ancient symbolic Kyrgyz designs on it + a DVD of my documentary + an invitation to my premiere. You will get a pair of hand-made Kyrgyz felt slippers (They are very comfortable and warm!) + a DVD of my documentary + an invitation to my premiere. A set of 4 beautifully hand-painted tea cups + a DVD of my documentary + an invitation to my premiere. A bottle of Kyrgyz vodka + a DVD of my documentary + an invitation to my premiere. For the homely: An invitation to a tasting of traditional Kyrgyz specialities. For the adventurous: A free 3-day stay in my yurt. + A DVD of my documentary + an invitation to my premiere. For the homely: An invitation to a tasting of traditional Kyrgyz specialities AND a poster-print of one of my photos in any size you desire. For the adventurous: A free 3-day stay in my yurt AND a 1-day donkey trek. + A DVD of my documentary + an invitation to my premiere. For the homely: An invitation to a tasting of traditional Kyrgyz specialities AND a poster-print of one of my photos in any size you desire AND an exclusive album of commented photos taken while shooting the documentary. 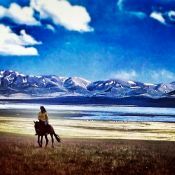 For the adventurous: A free 3-day stay in my yurt AND a 1-day horse trek. + A DVD of my documentary + an invitation to my premiere.